Is there a situation you need to discuss with someone on your team that makes you feel tense? Do you have the confidence or assertiveness to address topics with your colleagues or clients that you know they don't want to hear? Or, maybe you are a manager and have to talk about mistakes or improvement plans with your direct reports and need to give constructive criticism? While it may be easy to go and tell them directly what the problem is, direct communication may cause more problems than it solves. When we deliver negative messages, we must think of how we would want others to deliver those messages to us. Would we want the person barking commands at us, making us feel inadequate, or talk with (not to) us more like a partner, and work together to find a solution? The below presentation is derived from the book Crucial Conversations, and was used in a training program on Listening, Customer Service and Team Interaction. 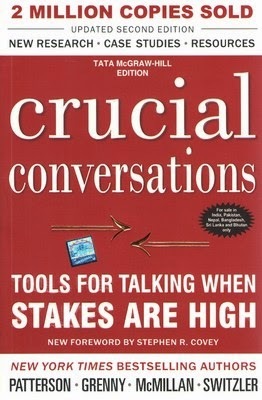 Jennifer Kumar, author of this blog is available to deliver face-to-face or virtual versions of this or other communication skills training programs to dispersed and global teams to help improve communication and relationships across cultural and global boundaries. Contact us today for more information. Avoid meetings and interactions that are "all over the place". Learn about this phrase.